A delicious and affordable young white Burgundy that you can drink any day of the week. This wine is incredibly versatile and food-friendly. It’s also great as an aperitif, with a cheese plate, or all by itself on a sunny day. Bio: Emmanuel and his two brothers make some of the finest wine in all of Burgundy. The vineyards have been organic since the 1950s but were only recognized as Certified Organic in 1991. They grow Pinot Noir, Gamay, and Chardonnay across three villages in Macôn. Following the traditions of their grandparents, they are shepherds of the land, growing their grapes responsibly and producing wines with as little manipulation as possible. They believe that good wine is made by the vines, not in the winery. Vineyard: Certified organic. Densely planted 10-80 year old vines. Blue clay and limestone soil. Aging: 6 mos neutral oak, 5 months enamel-lined vats. 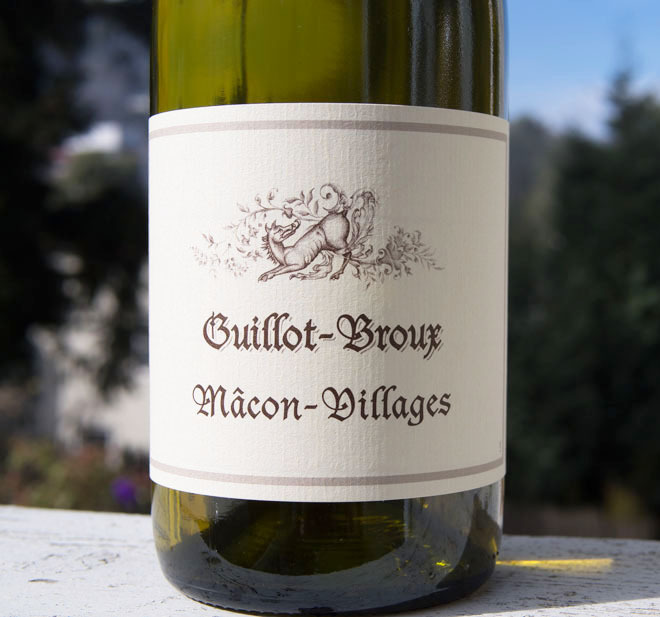 Production Notes: A blend of chardonnay grapes from three different villages within Macôn. Hand-harvested and sorted. Native yeast fermentation, malolactic fermentation in oak. 1700 cases produced. Tasting Notes: Exotic tropical fruit and brioche aromas. The palate is elegant and rich with white fruit and creamy notes of mineralty framed by a note of oak and vibrant acidity. Food Pairings: Excellent as an aperitif, or enjoy with hearty salads, fish, or roasted chicken.